Late Bloomer. 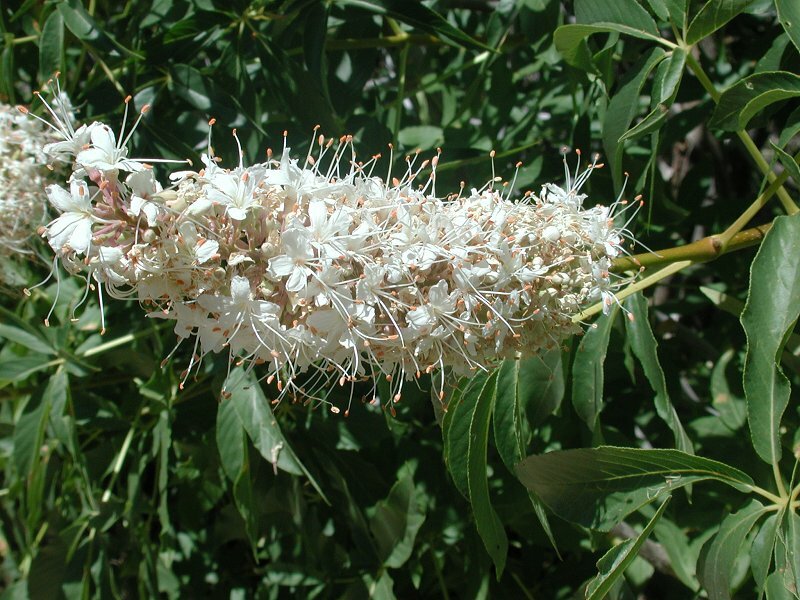 Broad tree with large, tall, pinkish white, fragrant flower spikes and chestnut-like seeds. Attracts butterflies. Notes: Buckeye (Horse-chestnut) family. One of our loveliest natives. 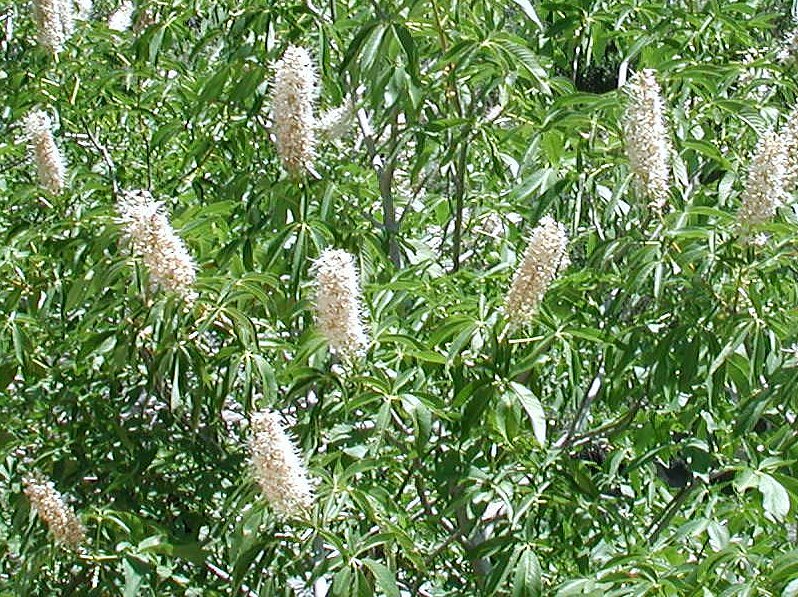 About mid-April the tree is covered with huge spires of flowers which are attractive to butterflies but poisonous to bees. At peak blooming period, it is a delight to see these umbrella-shaped trees and their flower spikes covered with butterflies. Poisonous to bees is an interesting plant strategy. Why would a species be poisonous to a potential pollinator? One can understand that many plants are designed for certain pollinators (e.g., Soap Plant for the Moth), but why would a plant be poisonous? Also, only one flower of the hundreds on a stalk (see photographs below) becomes pollinated because of a chemical reaction which occurs after the pollinator visits—again an interesting strategy. Oh well, in humans only one sperm among millions typically fertilizes an egg. The name comes from the seed balls, which have a white circular area on the surface that reminded some of a “buck’s eye.” The Osage Native Americans used the seeds to stun fish, by crushing and tossing the seeds into the water. When used for food, they leached the nuts longer than they did acorns. The nuts were broken open, soaked for a day, and then pounded into meal which was leached. It took all day to leach and dry, leach and dry ... at least 10 times. At the start of each leach/dry cycle, they laid a stick on the ground to keep count. Then the meal was cooked into mush and eaten right away. Another method was to bury the nuts in cold, swampy ground all winter, and then boil them in the spring. A tea was made from the leaf and used as a remedy for varicose veins and lung congestion. 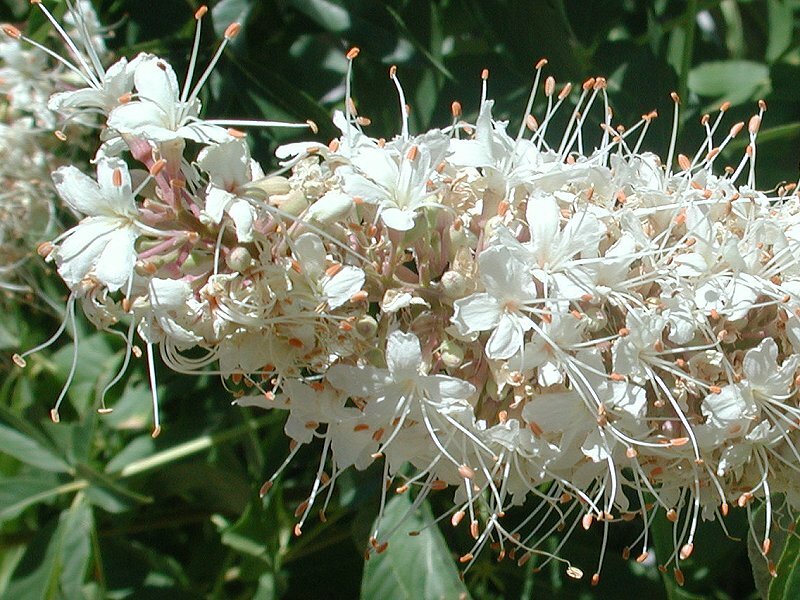 The buckeye was prized by Native Americans and settlers alike. Some settlers believed that putting a buckeye nut in the pocket would ward off rheumatism and hemorrhoids, while losing it would bring bad luck. 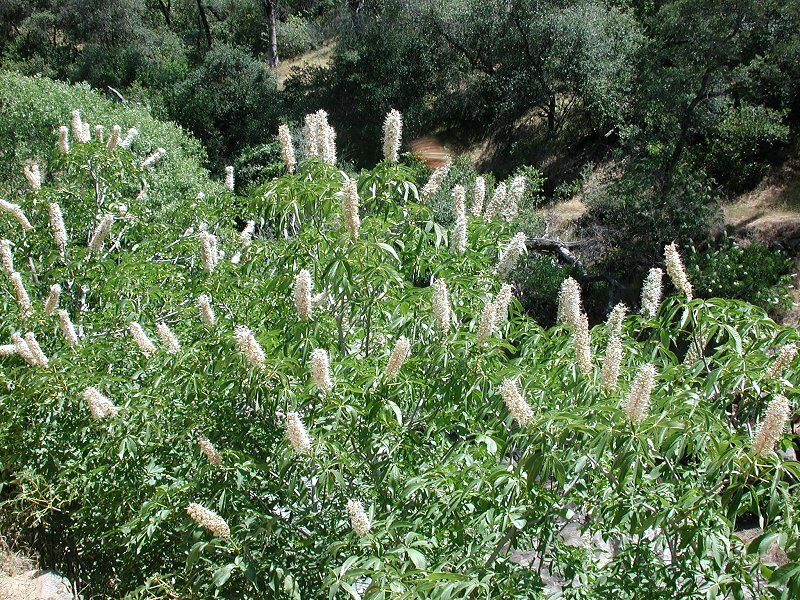 Species Aesculus californica (Spach) Nutt.